TYPICAL USAGE: Benign gastric and duodenal ulcers, bladder irrigation, bowel sterilization, decontamination of digestive tract, GI infections, metastatic germ cell cancer, oedema, oliguria due to renal failure. MECHANISM OF ACTION: Colistin is a surface active agent which penetrates into and disrupts the bacterial cell membrane. Colistin is polycationic and has both hydrophobic and lipophilic moieties. It interacts with the bacterial cytoplasmic membrane, changing its permeability. This effect is bactericidal. There is also evidence that polymyxins enter the cell and precipitate cytoplasmic components, primarily ribosomes. 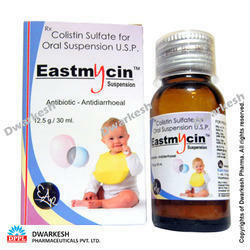 The Pre Biotic and Pro Biotic Sachets are meant for health and natural deficiency of the infants and children. 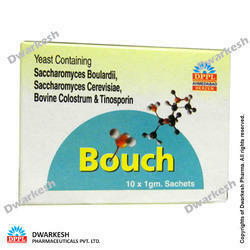 The Pre Biotic and Pro Biotic Sachets are manufactured adapting the latest formulae. This product can help restore the normal balance of intestinal bacteria. This product has been used for diarrhea and other stomach/intestinal problems. It has also been used for vaginal and urinary tract infections.